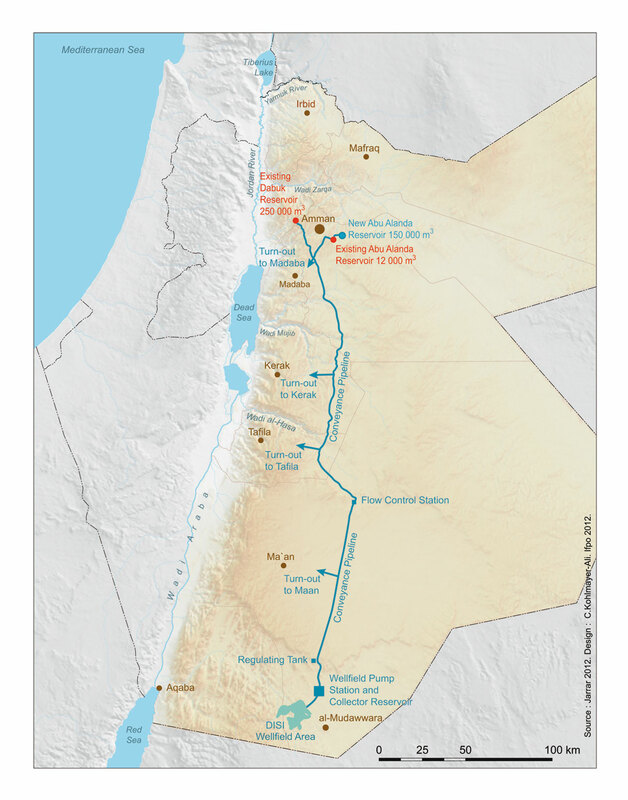 1In 2007, 40-50% of Amman’s water came from the Jordan Valley (pumped through the King Abdullah Canal), the rest was taken from aquifers in Zarqa and Mafraq or new aquifers in the South, such as in Lajoun (Van Aken, Courcier, Venot and Molle, 2007). The government’s decision to exploit the strategic Disi fossil water aquifer (Mudawarra) to ensure the supply to Amman illustrates the impending water crisis. 2The project includes the construction of a pipeline to carry water pumped from the Disi aquifer to Amman over a distance of about 325 km. 65 wells, 500 metres deep, will be dug in the Disi basin, the water will be stored in a 12,000 m3 reservoir before passing through the main pumping station, which will include regulating reservoirs (16,600 m3), flow-control stations and chlorination plants. This project is expected to provide an average of 100 Mm3 of high quality drinking water annually to Amman (MWI). 3The Disi Aquifer, also known as the Ram aquifer system, extends from southern Jordan to Saudi Arabia, most of it being in Saudi Arabia. Disi’s fossil water reserves were first exploited in the 1980s, when the government subsidized private irrigation projects covering 6,400 hectares of large cereal farms and orchards in the country’s southern desert in Disi (FAO, 1997). 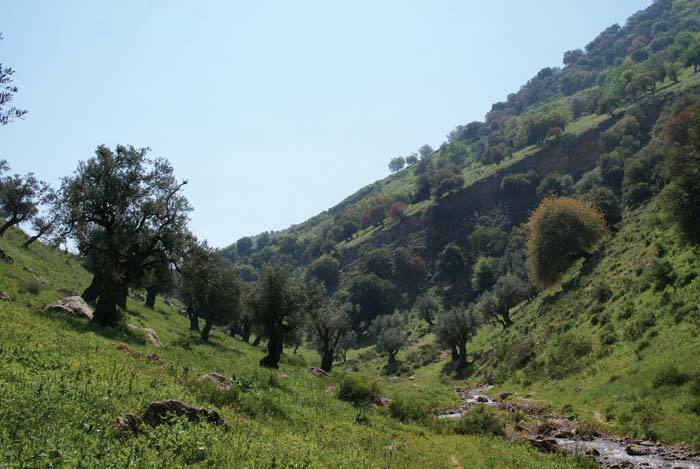 Today, approximately 80 million cubic metres of the Disi aquifer are tapped for agricultural purposes by four private farms in exchange for negligible compensation under a 25 year concession granted by the Government in 1985. 18 Mm3 are pumped from the aquifer for domestic use in the port city of Aqaba. However, the Disi aquifer is fossil water and is therefore not replenished. Consequently, due to pumping, it is already showing signs of depletion: its level is dropping by 80 to 85cm every year and its salinity in increasing at an alarming rate (Water Technology, 2004). Figure X.8 — Disi project. 4This project will probably solve the water deficit in Amman for an estimated period of between 20 (IRIN, 2007) and 100 years (Ghazal, 2007), after which the aquifer will be depleted. These estimates assume a simultaneous drastic restriction of the use of underground water for local agriculture. In any event, the Disi project is only a short term solution. 5This project of pumping water from an unsustainable aquifer is controversial since the effective limitation of the use of private wells would make available a much higher volume of water than that in Disi. It is to be noted, however, that this project was developed as a “Southern National Carrier”; water from the Disi aquifer was to be pumped temporarily, until the government is able to build a large desalination plant on the Red Sea in Aqaba, which would supply water to Amman (World Bank, 2003). A project that would transport water over such a long distance to supply Amman is all the more questionable as we know that the south of the country, and especially Aqaba, will soon require water for its major development projects (fig. X.8). DEMILECAMPS, Chantal. The Disi Project In: Atlas of Jordan: History, Territories and Society [online]. Beyrouth: Presses de l’Ifpo, 2013 (creato il 24 avril 2019). Disponibile su Internet: <http://books.openedition.org/ifpo/5060>. ISBN: 9782351594384. DOI: 10.4000/books.ifpo.5060. Demilecamps, Chantal. “The Disi Project”. Ababsa, Myriam. 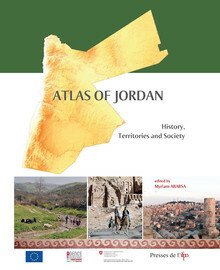 Atlas of Jordan: History, Territories and Society. Beyrouth: Presses de l’Ifpo, 2013. (pp. 428-430) Web. <http://books.openedition.org/ifpo/5060>. ABABSA, Myriam (dir.). Atlas of Jordan: History, Territories and Society. Nouva edizione [online]. Beyrouth: Presses de l’Ifpo, 2013 (creato il 24 avril 2019). Disponibile su Internet: <http://books.openedition.org/ifpo/4560>. ISBN: 9782351594384. DOI: 10.4000/books.ifpo.4560. Ababsa, Myriam, ed. Atlas of Jordan: History, Territories and Society. Beyrouth: Presses de l’Ifpo, 2013. Web. <http://books.openedition.org/ifpo/4560>.